Wilma Chudomelka, 88, of Norfolk, formerly of Schuyler, died Monday, December 5, 2016, at the Edgewood Vista Assisted Living in Norfolk. 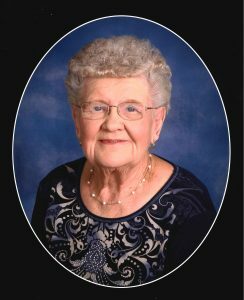 Funeral Service Friday, December 9, 2016 10:30 A.M.
Wilma was born April 22, 1928, in Sumner, Nebraska to Joseph and Emma(Mach) Kvacek. In 1946 she graduated from Schuyler High School and went to work as a bookkeeper for Pokorny Oil Company. On December 25, 1948, Wilma married Adolph "Bud" Lodl at the Methodist Church in Schuyler. They raised two children and Bud died in 1980. On October 10,1981, Wilma and Richard Chudomelka were married at the Methodist Church. Wilma had worked for First National Bank for over 30 years. She loved traveling and with her husbands had visited all 50 states. Her last trip was to Czechoslovakia. Wilma especially loved spending time with her family, doting on her grand and great-grandchildren, and enjoyed coffee and chocolate. She was a member of the Eastern Star, Christ United Methodist Church and is remembered for her wonderful smile. Wilma was also known to enjoy a shopping trip from time to time. Wilma is survived by her son, Larry(Barbara) Lodl, Centennial, Colorado, daughter, Lana Janousek of Norfolk, two Step-daughters, Kathryn Hunter and Cheryl(Rex) Turner, four grandchildren; Hayley(Pedro) Valadez, Norfolk, Zach(Cheri) Janousek, Portland, Oregon, Jake(Armida) Hanchey, Lakewood, Colorado and Jessica(Derek) Wiley of Tigard, Oregon. Also surviving are six great-grandchildren; Maiya and Julian Valadez, Emilia Wiley, Lauren Hanchey and Gwen and Gavin Janousek. She was preceded in death by her parents and husbands.